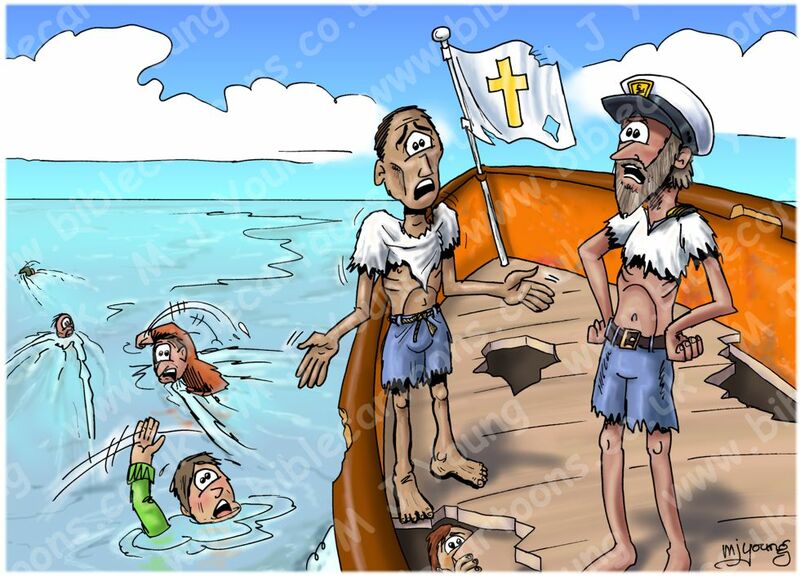 Bible Cartoons: The difference between a pleasure cruise & a rescue mission - Part 2. The difference between a pleasure cruise & a rescue mission - Part 2. Quick sketch of Church as underpowered, overworked Rescue Boat. The difference between a pleasure cruise & a rescue mission. In part 1 I wrote about the metaphor of Christian church being either a pleasure cruise or a rescue mission. Dangers of the extreme edges of “inward” & “outward” church focus. The church with an extreme “inward” focus. A church congregation which has an unhealthy, extremely “inward” looking focus is too preoccupied with themselves to do much good in the “outside” world. It is easy to become “obsessed” with ourselves, so that gradually our attention is more & more on us, as a congregation, so that we keep missing opportunities to tell other people (outside the church) about what we have found. One of the challenges we face is our tendency to try to perform well in all the roles we engage in. That can include church. We can take our “eyes” off the lost & get so involved in church life that we kind of forget about the “drowning” people going by! Sort of like a rescue boat that has forgotten the reason it is out on the water! Let’s not let that happen! Fear of rejection is often the reason we become reluctant to tell anyone about Jesus. No-one likes to start telling someone about Jesus & then get sneered at, or aggressively talked over. But then again, maybe we just need to pluck up our courage & not worry about the way we are seen or received by “drowning” people. Sometimes we just need to “get over ourselves”, screw up our courage & tell people about Jesus & his amazing love for them! The Holy Spirit is waiting for us to get involved in the “rescue mission” – it’s time we got on with it. Problem 01) Overworked, underfed congregation. Problem 02) Lack of Holy Spirit power. It might seem that a church that has an almost exclusive “outward” focus has it right. At least that congregation is going all out to tell everyone about Jesus! They get an “A” for effort when it comes to testifying about Jesus. … Unless the “boat” can demonstrate a BETTER WAY OF BEING, who would actually want to climb aboard?! If the congregation is full of harassed-looking, exhausted, duty-driven, toiling people, then who would want to join that “crew”?! A “boat” full of lively, engaged, energised, well-fed, confident & assured sailors would be INCREDIBLY ATTRACTIVE to a drowning person, both in terms of 01) Offering a real rescue from the water & 02) offering a long-term opportunity to live a MUCH better life & lifestyle. 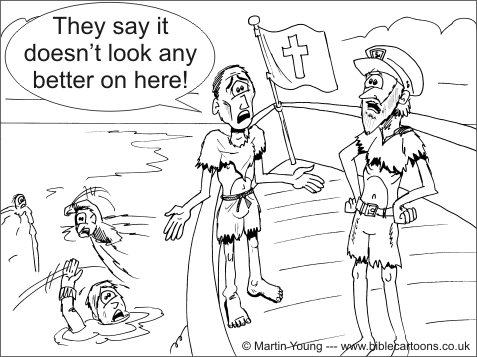 Unfortunately, the church “boat” that has an extreme “outward” focus can be “crewed” by a congregation depleted of energy & so fixated on service-to-the-community that anyone who that “rescue boat” approaches will start to swim the other way from, pronto! Just as the drowning people are doing in my cartoon! The point being: you can’t have such a strong service-to-the-community ethic that your own “boat” looks like it is about to capsize & go under! The Christian church DOES need to start rescuing people, for sure. But it also has to understand what it offers long-term: to display the kind of life & lifestyle that “drowning” people would leap out of the water for! The trouble is, some church congregations these days look so dull & boring that no-one would want to join them; “drowning” or not! It often comes down to us (Christians) not realising what we’ve been saved from, & not have a sure & certain identity derived from Jesus Himself. If we have that, then we start to look & behave like a “crew” that have something to offer! A strong service-to-the-community ethic is great, & to be highly applauded. PROVIDED that it is EQUALLY BALANCED with a “crew” that is well fed; well stocked, fully fit & strongly motivated. That comes from the “captain” – the church leader or leadership team. Ultimately, of course, it comes from Jesus himself, the master mariner! Allowing some people to rest completely from ministry, before re-deploying them “on duty” once more within the “rescue boat”. Powerful motivation doesn’t come from a guilt-driven sense of duty: “We must save people.” Powerful motivation for the “crew” comes from recognizing & realising WHAT they themselves have been saved FROM. That requires their “captain” telling them… often! You’d think we would remember that onvce upon a time we were “drowning” people – but somehow we forget! Reminders are powerful motivators. Recognising where we “fit” into the scheme; into the “crew”, is a great way of getting people deployed. Some are ready immediately to go on “active duty”, others need more encouragement. ALL will need regular pep talks, encouragements, & strong, clear, firm leadership, in order that they would actively CHOOSE to go out into the “dangerous seas” looking for people to rescue. If the “crew” is well fed, well equipped, well-directed & empowered by the Holy Spirit, then naturally it will be a strong “boat”. Which will mean that it will 1) be able to withstand the buffeting of the “sea” (spiritual opposition to the activities of God) & 2) naturally providing a strong “message” to the people in the “sea” (testimony that will be attractive & persuasive). When a strong, well-directed, powerful “boat” appears before that sea-drenched swimmer, they’ll want to jump aboard like a shot…, & they’ll want to be part of that Christian “crew” forever. Who wouldn’t?! Back to the rescue boat metaphor: if that “boat” doesn’t have any “life-saving equipment” (the power of the Holy Spirit) on board, then there will be lots of commendable talking to the drowning people (testimony), but very little power displayed. Without Holy Spirit power (signs & wonders) there will only be good words – no action; no power displayed. On the “boat” that is equivalent to encouraging people onto the boat, without throwing them a life line! It is the power of the Holy Spirit (rather than man’s persuasive words) which will cause the people in the water to recognise the danger they are in & say “Hey, you really have found a better way!” & THEN climb aboard. The danger of a Christian church having a disproportionate “outward” focus can mean that the people in the congregation are “under-powered” & end up exhausted by all the endless activities & duties of meeting the needs of people outside the church. We need regular top-ups of Holy Spirit power, in order to meet the needs of people outside the church, & if we don’t get it, then we start to loose power & be depleted, & end up in (almost) as bad a condition as the “drowning” people!!! Even Jesus took himself off to lonely mountainsides to recharge his spiritual batteries! If Jesus needed to do that, so do we! The danger facing a congregation that allows itself to become too depleted spiritually is that they get into “works” & doing all the church activity without reference to, & spiritually supplied from, Jesus Himself. Congregations with that powerful “outward” focus can find themselves underpowered, overstretched, depleted of power, & just “going through the motions”. There may be well intentioned motives behind all the activity, but without the Holy Spirit’s power, it is MERELY HUMAN ACTIVITY, & not likely to achieve much eternally. Remember, it is the Holy Spirit who convicts people of their wrong-doing, which is the equivalent of “opening their eyes” to the fact that they are in the “water” & “drowning”, in our metaphor. Once that happens, then the person will see their danger; see the great “boat” near them, & WANT to be saved. It won’t take lots of persuasive talk from us! In the next Blog (part 3) I write about the opportunities discipleship presents to us… & a choice.